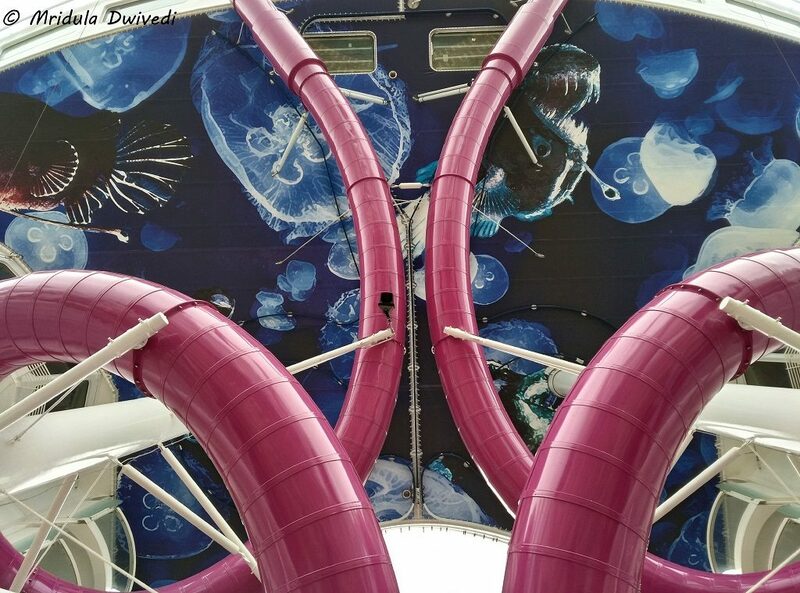 The Ultimate Abyss Slide on the Harmony of the Seas- I did it! 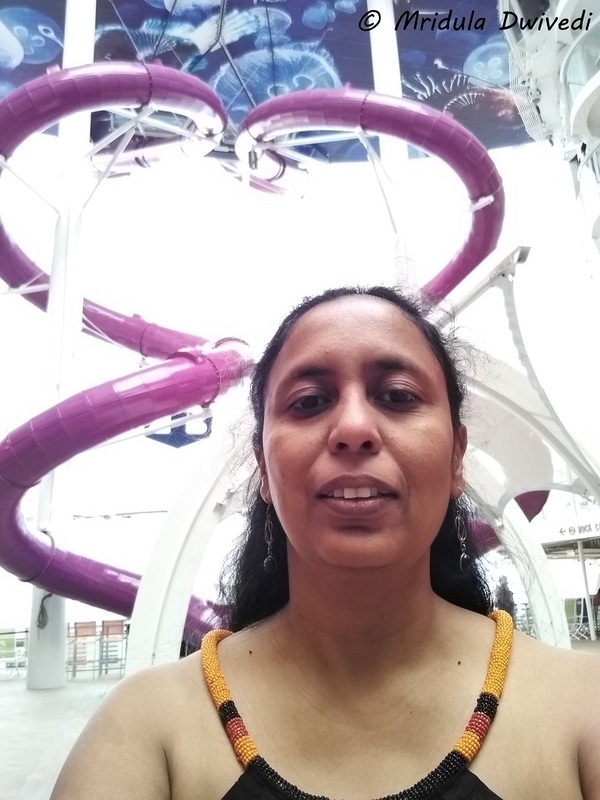 While I was waiting my turn on the Ultimate Abyss, the behemoth slide on the Harmony of the Seas, the two people sliding down at that moment were screaming at the top of their lungs! It felt like they were being tortured inside! There was just one more person ahead of me and soon it would be my turn. 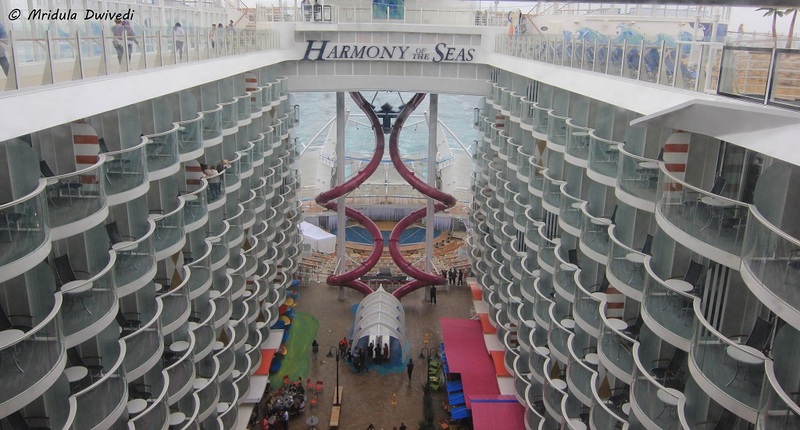 Even before leaving for the voyage on the Royal Caribbean’s Harmony of the Seas there was a lot of talk among us about the Ultimate Abyss Slide. There was some debate if it was a slide where you had to take off your clothes i.e. if it was a wet slide. I can now say with authority that it is a dry slide and there is no need to wear a swimsuit. In fact you need to slide sitting inside a bag because the Ultimate Abyss is made of stainless steel. Without a bag there would be high friction. Even though you go at 14 km per hour, it feels ridiculously fast inside the twisting turning tube! The slide starts at Deck 16 and ends at Deck 6 making it a fall of 10 stories. I was given safety instructions by a young girl. She basically told me to get inside the bag and hold the handle with one hand. Hold the slide with the other hand but once you let go, bring the other hand to handle too. Simple, right? No? Then it is my fault for she was clear in her directions and I understood it too. But I didn’t like the noise coming out of the tube, now it was the person who went just before me and he looked like a sensible gentleman too. My actual turn on the slide was scheduled for May 21. I had booked a GoPro for it with the media center. But when I got to know the slide was open to everyone on May 20th itself, I decided to go on a trial run, so that I would know with to do with the GoPro. Apparently it is a glass platform from where the slide begins but I was too distracted by the screams to notice it! And then it was my turn. The young lad at the mouth of the tunnel told me to hold the slide with one hand and enter. I was clutching the bag handle with all my mite with the other. Initially I did not slide, in came the head and told me to lie flat. And suddenly I shot off like a bullet! How long does the slide last? It must have been a few seconds in all but I am sure I acquired a few more grey hairs in that time frame! 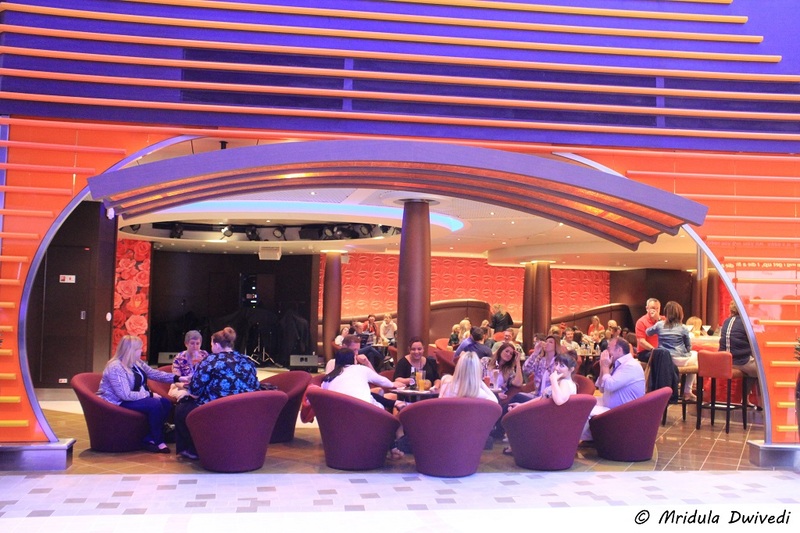 It is Not Difficult to Find a Bar at the Harmony of the Seas When You Need It! It felt specially mad at the curves. Twice I thought I would fly off to somewhere! And then it was over. I am not the screaming kind, so I did not scream but my face must have been chalk white when I got out. Someone clicked a picture but I have no clue who they were. How I want to see that photograph! I went off in search of a bar! I certainly needed a drink. The trouble was I had to do it again the next day with a Go-pro, I was committed. And now I knew what it would feel like, again! Truth be told I was not too keen but I did not see anyway out of it. The next day when I woke up it was raining. I went to collect the Go-pro I had booked. My breakfast was at the Windjammer Cafe. At 10 minutes to 11 am, my appointed time, I went back to the Ultimate Abyss. They told me it was closed due to the bad weather but it might open if the weather improved. I breathed a sigh of relief. 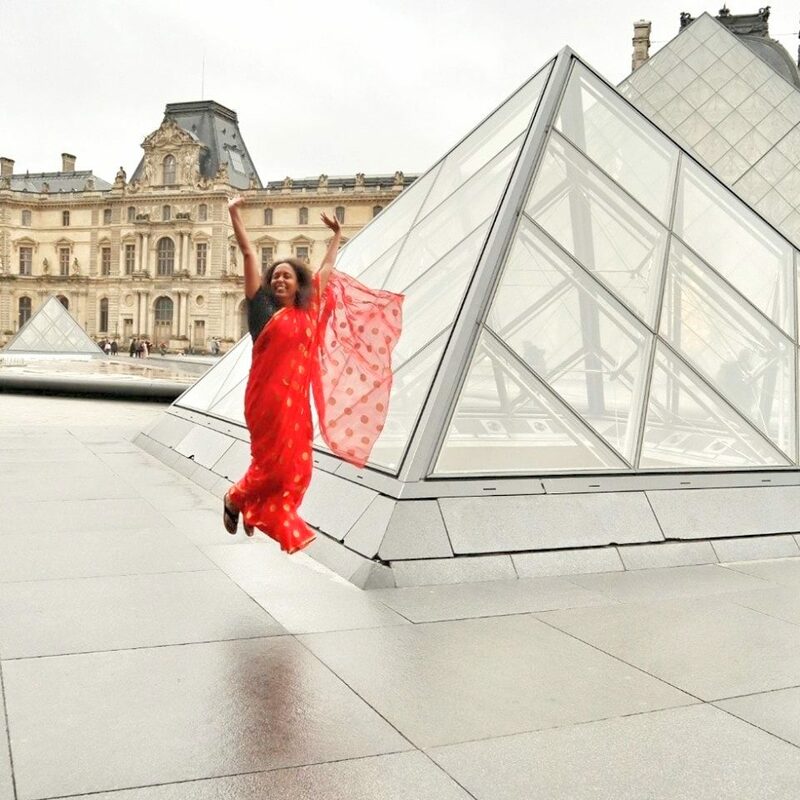 I was happy for the rains! The slide never re-opened on that day again! I would certainly like to go back on the slide some day, but the very next day, the answer was no way! On the other hand I thank my stars that I went on the Ultimate Abyss the day before, for to go on the Harmony of the Seas and come back without experiencing it would have been terrible beyond words! It might have been a real thrill and a great fun. Bravo! It was indeed but no way to be repeated the second day itself! Also, I too, am not of the screaming kind! In the end I believe it was lucky me 😀 Happy to hear that you to come off thinking you don’t want to do it again! Ha ha but you will love it too, at least once! Grey hair… chalk white face… 😀 it must have been a sight! But definitely worth an experience. Great pics! Did you just grit your teeth and feel as if your cheekbones were frozen and your eyes were going to pop out ? He he. I felt that way on one of the rides at a theme park.